Android is a fast Growing Operating System of Smart Phone Devices and is Popular with each update. Its user friendly applications, flexibility and versatility have made it more popular. Traj InfoTech offers professional android app development services. Our professional team will research and analyze your requirement. We have a wide range of tools and technology; with the help of this we create customized applications which are scalable and powerful for any android device. Our expert team ensures high quality android application that can help in expanding your business. Having excellent command on technology, good developers, testing and industry proven process, we are able to deliver you a perfect android application. Our Professionals have Developed Applications for various industries, they have built Android Applications for multiple domains such as Game, Security, Healthcare, Travel, Map, E-Commerce, Finance, Business and many more. What we can do for your clients? We offer reliable and cost efficient Android App Development Services. Our professional team provides solutions that can meet the business requirements or objectives. Updated knowledge, good ability and expertise in developing android applications are some of the distinctive features of our android app developers. Our company is unique and has been developing android apps for many years and has become expert in building android apps. If you have any app idea, please do share it with us and you will get to experience our reliable and quality service right away. Application Development can help improve the cost structure, technology competency and operational efficiencies of a business. Android is most widely used operating system in India and around the world. Our Android app development services adhere to best Android architectural standards and have a complete understanding of comprehensive android ecosystem that help us in building sustainable and scalable Android applications. Android applications can be used across all android platforms like Android tablet, Android wearable devices, Android T.V and Android phone. 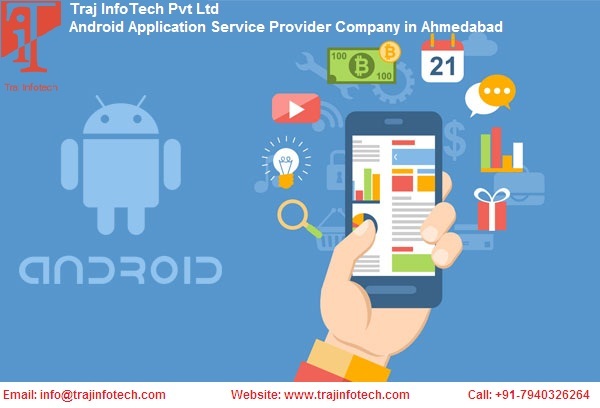 Our expert team can address rapidly changing technology and business needs by building Android applications tailor made to meet the business requirement or objectives.For more Details about Android App Development Service please contact us on our Company website Traj InfoTech Pvt Ltd is IT Service Provider Company in Ahmedabad.